Posted April 8th, 2019 by thomasgrove & filed under Uncategorized. Come shoot the breeze with Coach Thomas and Taya, get an inbody scan and re-evaluate your fitness goals. These times are in high demand. Please only schedule a time if you are sincere. Do not schedule a time if you have done an inbody scan in the past 8 weeks or have one scheduled in the next month. *This is for members only. Posted February 25th, 2019 by thomasgrove & filed under Uncategorized. Each team will consist of 2 or 3 persons. 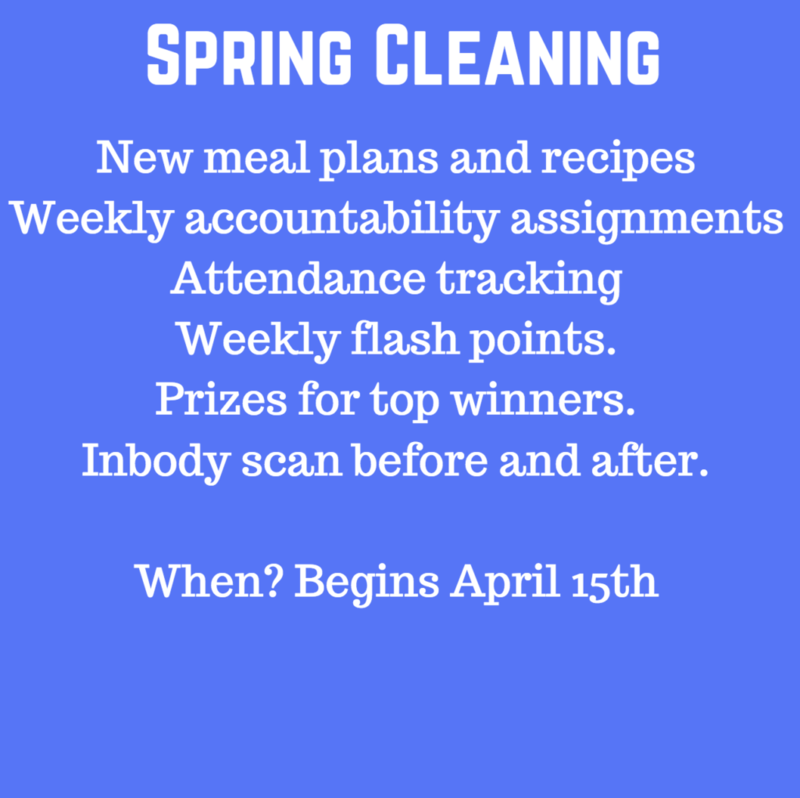 Winners will be assessed not by overall points won but by % of total of points possible. This keeps the playing field even for team of 2 vs teams of 3. All nutrition assignments submitted for the week=3 points. ALL assignments must be submitted. Partial submissions=0 points. All nutrition assignments must be submitted by Sunday night. Late nutrition submission will be forfeit. 2 weekly “Flash points” will be announced each week. Each person from the winning team will win a free 4 pack of supplements from prestige labs! Posted February 11th, 2019 by thomasgrove & filed under Uncategorized. Posted January 9th, 2019 by thomasgrove & filed under Uncategorized. *You must have a membership to be a beta tester. Posted December 13th, 2018 by thomasgrove & filed under Uncategorized. Here is a list of toys in need. Unwrapped. Posted November 12th, 2018 by thomasgrove & filed under Uncategorized. 🚨How to sign up- You can call Coach Taya and she’ll sign you up over the phone or Simply use this link https://bit.ly/2z8WLyP . Bring a friend day is this Saturday! Posted October 23rd, 2018 by thomasgrove & filed under Uncategorized. Bring a friend day is this Saturday Oct 27th. We will have a second coach on staff to ensure they are getting an effective and safe workout. This is a free session! Those that bring a friend will need to show up at 8:45am to fill out the waiver. Those that show up late will be politely dismissed for the safety of themselves and the respect of starting the session on time. See you and your friend this Saturday! 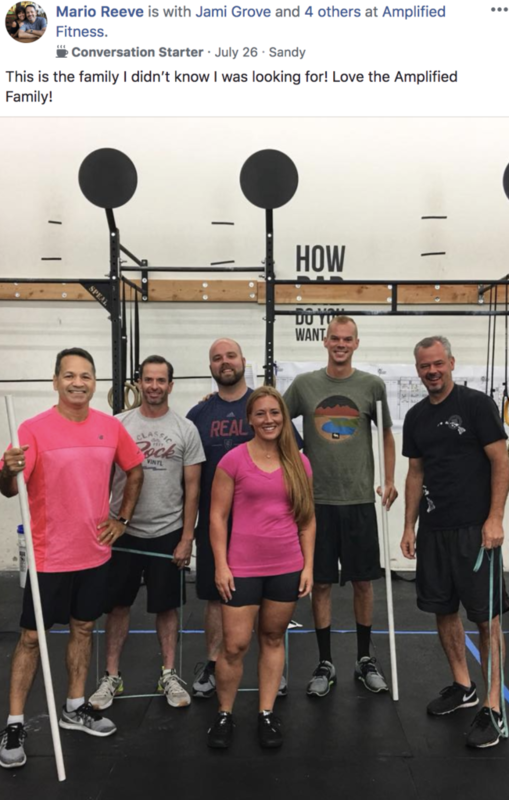 October member(s) of the month-Mario Reeve! Posted October 3rd, 2018 by thomasgrove & filed under Uncategorized. Congratulations Mario on being chosen as member of the month! This means a coach has spotlighted because they’ve notice your incredible work ethic and value to you bring to our community. A brief history at Amplified Fitness. Tell us how you got started and your experience. 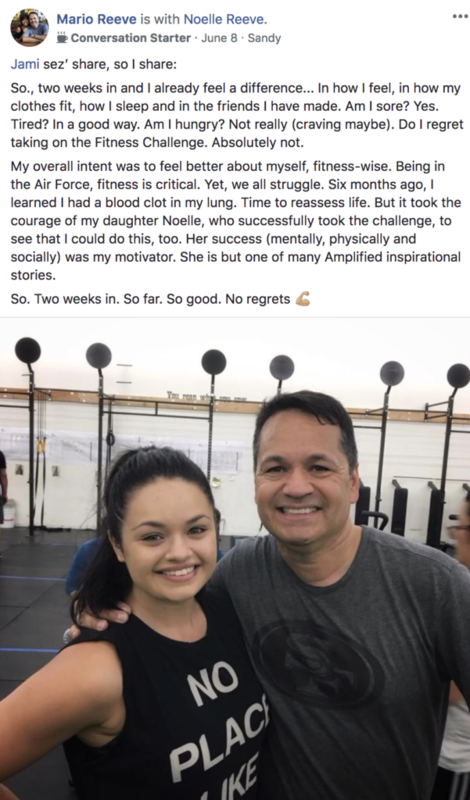 — My daughter Noelle joined the Fitness Challenge last January. I could see that through Amplified she was stronger physically, emotionally, and mentally. 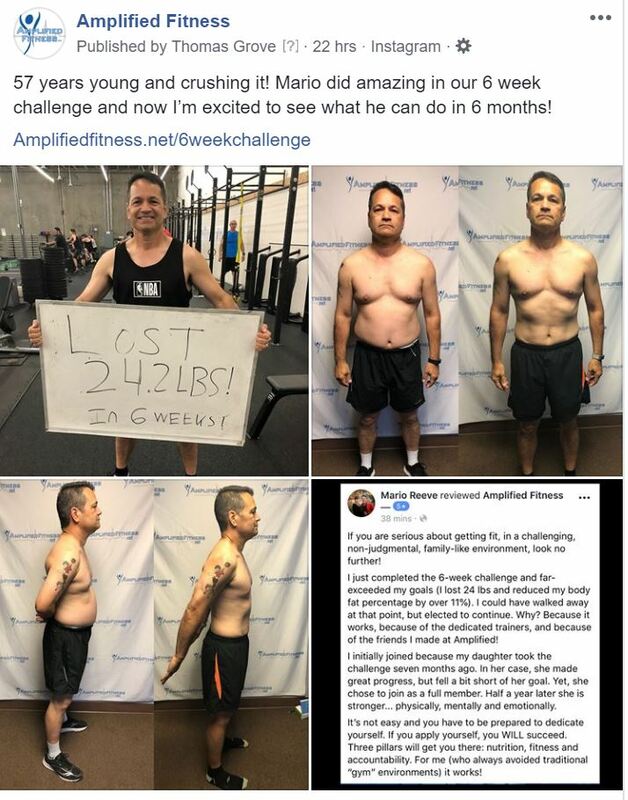 Her confidence levels and self-esteem were the highest I’ve ever seen… when I was looking for an improvement in my own physical well-being, I looked towards Amplified and took the Challenge! — I’ve seen my weight and body fat numbers improve better than I could have imagined. At 57 years old, I believe I am at the best shape of my life, simply because your pillars (fitness, nutrition and support) work. No struggles… I was “coached” that I will only get what I put in. So the struggles are really stepping stones to my success. I attend no less than 5 days a week and try to squeeze in a Savage Saturday in when I want to really test my limits. But, I do increase my activities, even outside of Amplified in order to meet my goals. Making new Amplified friends… and then watching as those friendships flourish because of similar goals. Also… seeing other’s progress! Maintain weight, yet recompose fat weight to muscle weight. The people. The culture. The support. The coaches. The burpees. Exactly as Thomas said from day one: it’s a family. Which charity have your chosen for Amplified Fitness to donate to? I’ll take the sled. I figure I lost 25 pounds, so it’s really ony a 75 pound sled. It’s an investment in yourself… much more than a gym, but rather a true tribe in which you can find success if you apply yourself.